These are also found unstippled. BASKET of ROSES: There is a special thrill in researching the bon-bon shape, for in many cases, as with this pattern; the design appears only on this shape! Similar to the Fenton Wreath of Roses, closer examination reveals the distinct differences. This is a collar-based, two-handled bonbon, while Wreath of Roses is found on a stemmed bonbon, having a rose in the center with Wide Panel exterior. Most Basket of Roses examples carry the N. trademark. The background may be stippled or plain and the exterior design is Basket weave. Another very important difference: rarity and value. Wreath of Roses is readily available, while this bonbon is rare in any color! A realistic guess is that fewer than 50 examples exist in Marigold, Amethyst or Cobalt Blue. Certainly a green or white one is not out of the question, so keep your eyes focused for the prize! You just might find one of those. Click on ~~ ~~ in our Alphabet to be taken to view an amethyst Basket of Roses. Threaded Exterior of BUTTERFLY Bonbon. 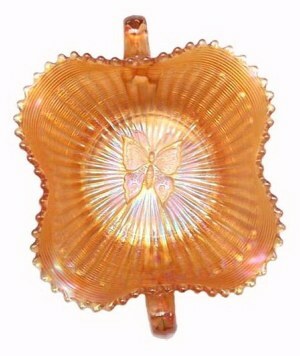 BUTTERFLY: Those with plain exterior: marigold, amethyst, green, smoke. Threaded exterior examples: marigold, amethyst, green, cobalt blue, ice blue. Again, this pattern is exclusive to the bonbon shape! 1910, Northwood introduced this simplistic design of the Butterfly against a Stippled Rays background. The plain backed version is not terribly difficult to locate, excepting green, along with the very rare smoke which is an unusual color from Northwood. Threaded back bonbons in any color are quite scarce, in other than amethyst, which turns up occasionally. Relatively few green examples offer themselves and the ice blue ones are extremely rare, requiring heavy cash outlay. 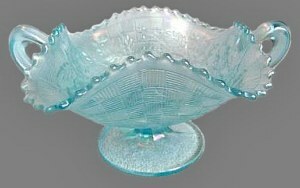 Existence of the ice blue examples confirms production extended into 1912 when Northwood introduced their pastel colors. (Click on ~~ ~~ in our pattern index to view a threaded ice blue bonbon.) No ice green or white examples have yet been reported, but they could be hidden somewhere out there! No question about the color! Lime Green it is on this FRUITS & FLOWERS Bonbon. FRUITS & FLOWERS: Stemmed, two-handled, plain examples of these bonbons are found in marigold, amethyst, green, cobalt blue, white, ice blue, ice green, lime green, russet (olive green), clambroth, lavender, smoke, teal, aqua opalescent, sapphire blue, ice blue opalescent. Stemmed, two-handled, stippled: marigold, green, cobalt blue, Renninger blue. Addition of small blossoms secured into the pattern, separates this design from the familiar Three Fruits pattern. 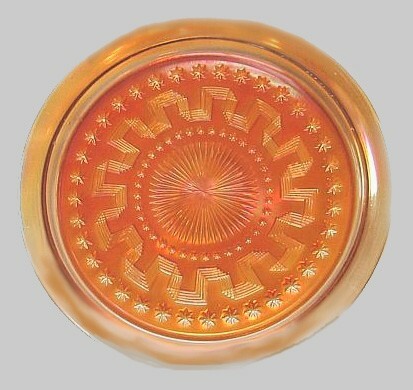 Bowls of varying sizes, 9” flat plates, and hand-grip style plates are also known in this pattern. Perhaps these stemmed bonbons are a favorite shape. Marigold, amethyst, green and cobalt blue do not present much difficulty to locate. Other colors present a challenge. 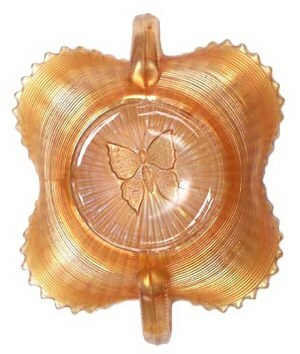 Production of this bonbon shape extended over a good many years from 1910-1911 to 1919-1920, confirmed by existence of their exclusive russet color which came late in the era. A rare Sapphire bonbon may be seen when clicking on ~~ ~~ in our pattern alphabet on the homepage. 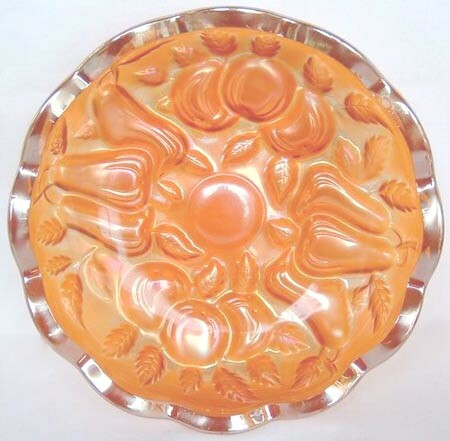 HOLIDAY : This tray was often marketed as an under-tray for water sets and liquor sets. 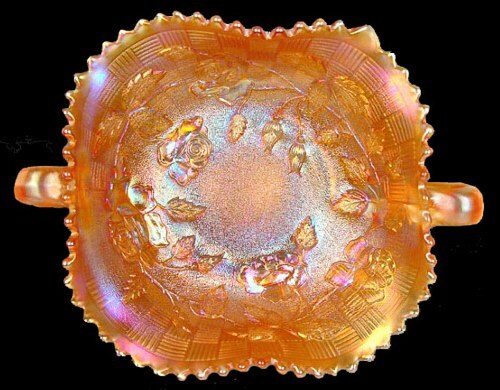 Found on rare occasions in crystal or this very rare marigold color, Holiday is a carry-over pattern from the pre-iridescent production. 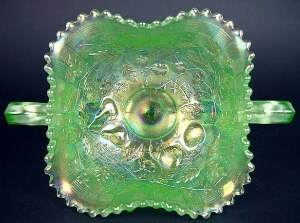 The tray appears in company with a Grape and Cable wine set in a Spring 1912 Butler Brothers wholesale catalog. May be viewed in our: Grape & Cable – Part 1 segment. INTAGLIO APPLE and PEAR-10.5 in. diameter- sold for $75. Burns Auction - 2005 ACGA Convention. Spring 1908 Butler Bros. Wholesale Catalog. 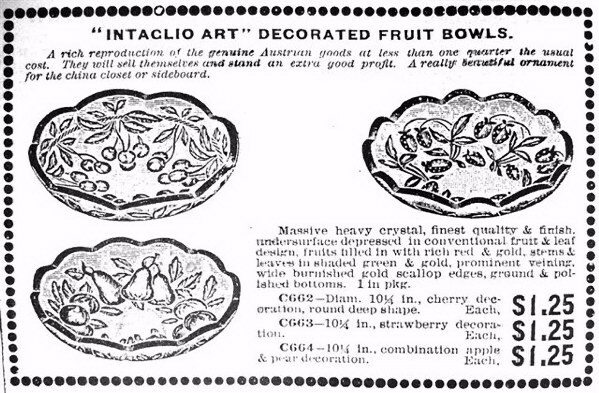 INTAGLIO LINE: Pre-iridescent production from the Northwood Intaglio line, circa 1905-1908 is verified by the Butler Bros. wholesale catalog ad from Spring of 1908. 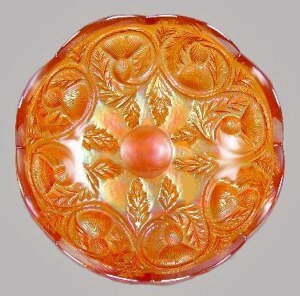 Collectors today call these decorated red/gold painted examples, “goofus glass”. Patterns offered in these intaglio pieces are deeply impressed onto the underside, rather than in raised relief on the inner surface. 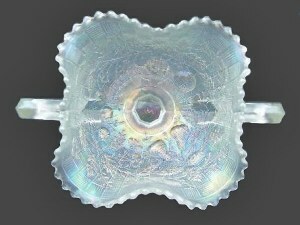 We lack the Intaglio Cherry pattern here, but these pieces are seldom seen today, indicating a short production run in the iridized form. 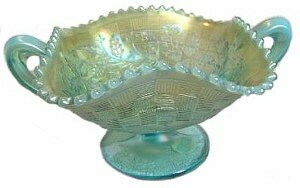 Iridescent production, circa 1908-1909 was to gain a quick share of the new market for carnival glass while other designs more appropriate to iridescent ware could be developed. 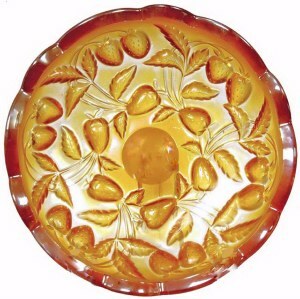 10” ice cream shape master berry bowls and 4 ¾” ice cream shape small berry bowls in marigold are the extent found in this Intaglio Line. They are quite heavy at nearly ½” thick and most are unsigned.